While I do love this series and feel that every fan of British Sci-Fi needs a copy in their collection, I can only comment on the video quality of this Blu-Ray. It is dubbed as a fully remastered edition, and I've seen the Blu-Ray copy of this sell for $60 or more. I'm doubtful if it's worth the $21 (Canadian) that I payed. Really most of my VHS tapes look better than this. The opening title screens look smeared and smudged out like they ripped it from a tape stored next to a bunch of magnets. My DVD copy of the Survivors series from the 1970s looks infinitely sharper. I can't tell what remastering they did at all besides maybe the audio is a bit crisper. This is a three disc set, but ALL of the actual episodes fit on just one disc. The other two contain the kind of short documentary clips you'd expect....and two discs worth for those interested in that sort of thing. I'm not saying don't get it, but I don't think there is any advantage to it being on Blu-Ray and can't imagine that this is the best copy they could find to rip it from. My suggestion is just find the cheapest DVD you can get, unless you must have the extra features. 5.0 out of 5 starsA must have if you are a HHGTTG fan! It's dated, low budget, and very , very silly. The classic TV series inspired by the classic radio plays and inspiration for the book. Essential viewing for die hards and casual fans alike. 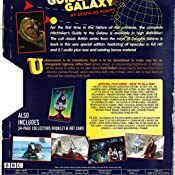 Ever since I was a young man and first read the works of Douglas Adams I have been looking to get my hands on this original BBC Series based on (and starring many of the same cast) Douglas Adams Radioplay. I was ecstatic to finally receive my copy in the mail. The slipcase and bluray case were in pristine condition, almost as if I were to be the first person to lay my hands on it, but upon actually opening the case, I found that the bonus 24 page booklet had been torn and ripped. I literally have no idea how the case could've been in such great shape yet the booklet on the interior of the case was slightly damaged. First, to answer the questions i would ask about this item before buying it: The first disc (190 minutes) contains all 6 episodes from the original TV series; image and audio-wise, it's what you would expect for a TV production of that vintage. The other disc (130 minutes) contains an hour-long making-of documentary from 1993, another 20 minutes of outtakes from it (mostly reminiscences from the cast and crew), a very nice profile of Douglas Adams done shortly after his death, and several other "backstage" items that will interest fans of the series -- and at this price, who else would buy this DVD set? 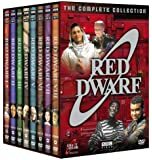 It's cheaper than the 14-CD set of the complete radio series (which of course was the original format of the show) but rather expensive for its content. 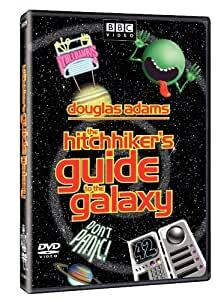 If you're a Douglas Adams fan and like to read, then the books are a better deal. But the TV version does have its own excellence (especially in the way it adds graphics to Adams' script) and is worth watching repeatedly. And this certainly is a major improvement over the old VHS tape of it. Just don't forget your towel! Excellent series with lots of extras for the hard-core fans. I had read a review that cautioned that the voice-over narration that accompanies the animated bits are only audible when you switch to mono audio output. This was not the case for me. I was able to hear the narration in full stereo. Also, there is a hidden "Easter Egg" that took me completely by surprise when I stumbled upon it. I was in university when this burst onto TVO and we were gripped by its originality... I would say that it has aged a bit, and the ending still leaves me as unsatisfied as I was originally, but it remains great fun. The extras are good, but I found the set-up structure very awkward to operate. Still, it remains light-years ahead of the recent, re-made version. I would recommend it for the younger generation which only knows the series from the novels (and I bought those when there were only three in the series!). my favorite looked for years for this dvd. I first saw this in 1981 and it has only improved with age. Douglas Adams could really make one believe that you had ventured into space with his wonderful turn of phrase and Simon Jones as Arthur Dent certainly made you believe in humankind. I am glad i bought this.